Android offers tons of customization features: you can install a custom launcher, use themes and personalize your home screen with widgets. In Android 4.2 Google introduced lock screen widgets which are a great way to give your lock screen more power than just “that screen that you quickly leave anyways”. If your phone does not support Android 4.2, you can always consider flashing a custom ROM or installing a third party application. 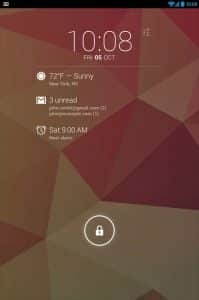 This guide will give you a selection of cool widgets for your lock screen and tell you how to customize your lock screen with Android 4.1 and below. Which information do I need on a regular basis? Which apps do I want to launch quickly? And ultimately, do I really need this widget? You have to consider that using lock screen widgets will lead to more battery usage. You are using more apps (= widgets) at the same time and, depending on the widget, these might need a constant internet connection. It is for you to balance convenience and battery time. I personally only use two widgets and don’t feel much difference in terms of battery consumption compared to the “stock Android lock screen”. 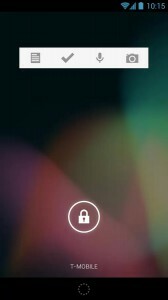 When running Android 4.2 or higher, simply go to your lock screen and slide to the left to add lock screen widgets. It’s as easy as that. To change the main lock screen widget, simply hold it for a few seconds until you are able to move it to the trash can. You should now be able to set a new main lock screen widget. DashClock is awesome “all-in-one” solution. It replaces the clock on your lock screen and displays additional information like the weather, missed calls / text messages or your next appointments. The cool thing about it: DashClock is open source and there are tons of add-ons available that you’ll love! From WhatsApp and Facebook integration as well as music controls, DashClock offers everything you need which makes lock screen customization unbelievably easy. If you want to see all important information on your lock screen, DashClock is definitely the way to go. I’m using it myself and really enjoy it! The widget comes for free and works on all Android devices running 4.2 or higher. I tend to forget things. Constantly. That’s why I always need to take notes, record something or take pictures. Google Keep is a nice app that helps me to gather my notes. Sometimes I have to react really quickly and that’s when the Google Keep widget comes in handy. I use it on my second lock screen to the left which makes accessing it really easy. My To-Do list is always quite long. Any.Do helps you to organize your tasks in a clean and minimalistic design. The cool thing about it? It synchronizes your tasks on Android (and iOS) devices with the Chrome browser on your computer. You’ll never forget your tasks on the go again while also being able to set new ones for a later point in time. Quite handy, right? Just like with Google Keep, I wouldn’t really recommend to set Any.Do as your main lock screen widget unless you really want to focus 100% on your tasks. Simply place it on a second or third screen, and you should be good to go! Any.Do is available for free on Google Play. As the name already implies, Simple Dialer Widget offers the possibility to place phone calls directly from your lock screen. 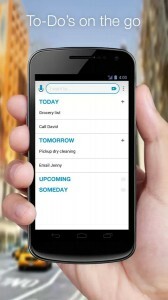 The widget is basically a copy of the standard Android calling app, showing your recent calls and address book. I personally wouldn’t recommend to put this widget on your main lock screen to avoid randomly calling people, but maybe on the second to quickly place calls without unlocking your phone. Simple Dialer Widget is available for free on Google Play and requires Android 3.0 and above. Please be aware that you’ll need Android 4.2 or higher to use it as a lock screen widget. Using the Gmail widget on your lock screen is quite handy if you receive a lot of emails and quickly want to check if anything important has arrived in your mailbox. While your Android device usually only gives you a short notification that you received an email, the Gmail widget let’s you check your emails in your lock screen just like in the app. Quite handy for the e-mail junkies out there! The widget is included in Google’s Gmail app. I hope that this article gave you a good introduction to lock screen modification and widgets. Remember that you can basically place every widget on your lock screen, but overdoing it might hurt your battery life. Try to keep it to a minimum and enjoy your new Android experience. Do you have any favourite widgets for your lock screen? Share them in the comments below. Let me also know if you have any questions and I’ll do my best to help you!